Brewing Kombucha is easy. In fact it’s so easy that many people make multiple kombucha brewing mistakes and still end up with something safe and drinkable. But who wants to settle for that?! Getting a free SCOBY from a friend or online message board can be great. However, in some cases, you may be receiving an older, dormant Kombucha SCOBY. In other cases, there may not be enough culture or starter liquid included. Occasionally these free cultures have vinegar eels or other contaminants. Even those purchased from some vendors can be of poor quality. Many are very small (even test-tube sized, not a joke). Others are dehydrated SCOBYs which almost always lead to mold or a failed brew. And yes, vinegar eels have been found in commercial cultures. When buying a SCOBY online, make sure the vendor has lots of recent, reputable reviews. They should also include a large SCOBY, at least 5-6 inches. For each SCOBY, there should be at least 1 full cup of strong starter liquid. At KKamp, we have shipped SCOBYs all over the world for more than a decade, with over 100,000 happy clients, and all of our fresh live cultures are guaranteed. Similar to the above, the quality of the SCOBY and starter liquid is important to the long term health of the brew. Due to many changes in the commercial products available, growing a SCOBY from them is no longer recommended. As the article explains, while a culture may or may not grow, many drinkers report even if they are successful at growing what looks like a good SCOBY, the brew is weaker in flavor, especially over time. There are very many Kombucha manufacturers, all with different methods for engineering their beverage since the reformulation, some via added lab cultured probiotics, some by altering the brewing process itself, and others who keep their processes a secret. With so many variables, the only recommendation we can make is to start with a guaranteed culture. Proper, strong Kombucha starter liquid is a sort of liquid SCOBY, living probiotic fluid that has the same bacteria/yeast balance, distributing a little throughout the whole brew and dropping the pH of the sweet tea to a safe level while the SCOBY acts as mothership to the young brew. Without starter liquid, the SCOBY is the only source of bacteria and yeast, requiring much longer for the brew to gain similar power. Some sites or even SCOBY sellers tell you to use vinegar with the SCOBY. That’s a warning sign to stay away! Any good SCOBY should come with at least 1 cup per culture. That liquid should smell very strong but also smell fresh, not stale. As to the questions of adding vinegar, raw vinegar has its own cultures and should never be used. While sprinkling a little pasteurized vinegar on top of the brew may help prevent mold by lowering pH, it does not aid the SCOBY in it’s process, so the problems of slow, flat and improper acidification and flavor will still occur without starter liquid. Future batches may improve if only liquid is used from the batches rather than vinegar. KMamma Sez: Starter Liquid Tip – Oh no, you let the culture dry out and have no starter liquid? If you do not have any liquid at all but what you think may be a viable SCOBY, you can make just 1 – 2 cups of sweet tea, pour over the culture in a small bowl, and add a cloth cover. Allow the culture to turn that small amount of liquid into well fermented Kombucha, which may take a 1-3 weeks. Maintaining as close to 80 degrees will improve chances for success. Once done, use all of that to make a 1 gallon batch. If the culture was strong enough on its own, you should have a nice batch of Kombucha after 7 – 14 days. If not, then you know the culture was too weak anyway and you can start with a fresh one. 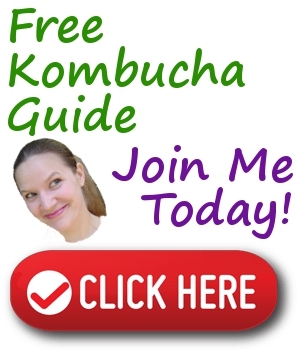 Learn more about Kombucha and water here. Many “flavored teas” are actually just herbs, not real tea. Kombucha requires real tea, aka Camellia sinensis which is the tea plant, to thrive over time. We can usually make one or a few successful batches with an herbal infusion or flavored tea, but over time the bacteria and yeast tend to lose power due to lack of appropriate fuel. Additionally, oils present in some herbs or flavored teas may act as antibacterial agents themselves, so using a backup SCOBY from your Hotel is advised whenever trying to make Kombucha with these ingredients. Then return that SCOBY to a special Hotel just for rejuvenating “Flavored” Kombucha SCOBYs, and add real tea with sugar to that Hotel so they can “re-charge” between brews. However, don’t return those SCOBYs to your main Hotel to prevent cross-contaminating the oils or other elements from the flavored teas or tisanes into the primary backup. Another way to flavor is in the second ferment. Tisanes may be used just like other flavorings by adding them right to the second ferment. At that point, you may choose to strain them out after a day or two to prevent the flavor from becoming overpowering, or you may find leaving them in creates the result you prefer. There is no wrong way. Additionally, you may choose to brew a concentrate of the tisane and add that liquid to the second ferment rather than the tisane itself. More about Flavoring Kombucha here. Many first time brewers hope to make Kombucha “healthier” by not using sugar to brew. Based on our current food supply, we can understand the desire. But that doesn’t work with Kombucha! The sugar is fuel for the process, and fake sugars just won’t work. Check out more about sugar and Kombucha here. As for RAW honey, that is best used with JUN Tea. You can use pasteurized honey with Kombucha. For best results, Kombucha requires a breathable, cloth cover. However, cheesecloth is NOT a good idea. No matter how many times you fold it over!! Fruit flies and other contaminants like mold will get into the brew over time, it’s just a matter of when. Also, coffee filters may be a fine stopgap if nothing else is available, but they are not a good solution long term. The vessel is the home for your brew, and everyone needs to feel safe at home. Be sure to use only safe materials and vessel types, you can learn more here. The spigot is just as important, visit this link to learn how to select a safe spigot. It’s good to be clean, but unless there was mold in the previous batch, often all that is needed is to rinse the brewing jar in clean water. Using soap between batches or repeatedly is probably not necessary and may actually harm the microorganisms if not cleanly rinsed away. Check out more Kombucha safety recommendations here. If you do have mold or a dirty vessel that requires a soapy clean up, it may be wise to cure the vessel after rinsing. This involves just using a small amount of vinegar or well fermented Kombucha to coat the inside of the vessel, then dumping the remaining out. However, NEVER use raw vinegar or apple cider vinegar to cure vessels, as this can lead to imbalanced brews or vinegar eels. Body temperature or below is the best temperature to avoid harming our little bacteria and yeast buddies! While you can try just about anything with Kombucha, and there are recipes for adding flavorings to your initial brew, it is complicated. It can also lead to mold, and requires maintaining specific cultures and Hotels for each flavor made. Instead, it is much easier and wiser to simply flavor the second ferment. This means removing the SCOBYs and liquid for the next batch, then adding flavors to the bottle or vessel. For Continuous Brew, it simply means adding flavors to the bottle and decanting through the spigot. It’s no problem to have the brew around some indirect light, but avoid window sills or areas that receive direct sun exposure if possible. 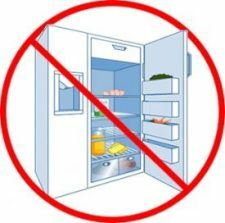 Inside a cupboard, pantry, or even on the counter back against the wall are usually fine locations. SCOBYs and the brew should never be refrigerated. (Once it’s bottled, you can refrigerate as you like, since that will not be used to brew. Keep the SCOBYs and brewing liquid at room temp.) Unfortunately, many websites continue to spread this old wives tale. Store at room temperature for best results. Kombucha prefers 75-85°F (24-30°C), with 80°F (27°C) as the sweet spot. Learn more about heating all your ferments here. Relax! It’s normal to be nervous and excited, but let the brew do it’s thing. The early stages may look unusual or even scary, but allow 5-7 days before getting too concerned. 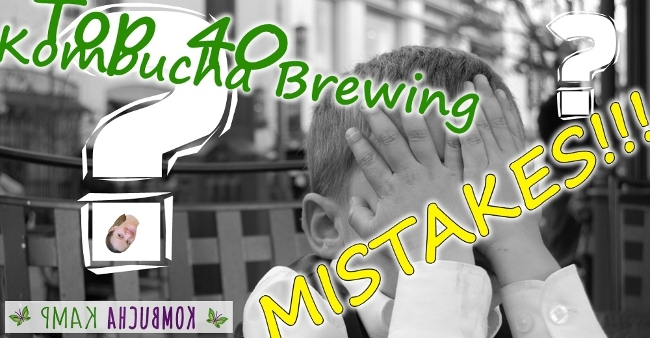 One of the most common Kombucha Brewing Mistakes is thinking yeast is mold. Click the photo to see more examples. Fruit flies are also known as vinegar flies and as such, they LOVE Kombucha. As long as they are not getting in the vessel, they cannot affect the brew. However they can be annoying. Shoo them away prior to opening the brew, and make sure none have landed inside before covering again. You can set up fruit fly traps to minimize the amount of flies present. Another tip is to place a sprig of lavender or other strong smelling natural plant on top of the cloth cover to keep them away. Or put a couple of drops of essential oil on a separate cloth (not the cloth cover for the vessel) and place that cloth in a ball on top of the cloth cover, to help keep away the flies. Generally as the weather cools, fewer of them will be present. We’re not trying to grow a certain size SCOBY, we’re trying to make delicious Kombucha! So as long as there is some SCOBY growth, and you have the other signs of a healthy brew present, the brew is progressing safely. If making a gallon, it’s usually a good idea to taste around 7 days. If it’s too sweet, give it more time. But don’t wait for the SCOBY to look as thick as your KKamp SCOBY, harvest when you like the flavor! If it’s mold, it must be thrown away. Toss it, culture and all Kombucha. The mold spores can be in the liquid and pass to the next batch. It’s not worth it, especially since you will have already set up a SCOBY Hotel and have plenty of extras to start again! If Batch Brewing and you have no SCOBY Hotel, you will need to save at least 1-2 cups of liquid from the TOP of the current brew to use with the SCOBY(s) to make the next batch. If you forget, see the Kombucha Mamma Sez Tip in #5 above. A little flavoring goes a long way with Kombucha! Learn more about flavoring Kombucha here. One of the reasons that new brewers have trouble with carbonation is too much or too little yeast in the bottles. By filtering it all out, you may end up with none to make the bubbles. Or if pouring all the dregs from a batch into one bottle, you may end up with so much yeast that the taste is bad. Worse yet, the bottle could build up pressure and explode. Check out our bottle recommendations here. Finding the balance of when to bottle is part of dialing in your perfect recipe. We like to bottle when the brew is still a little too sweet for our liking. That way, it can continue to mature in the bottle at room temperature in our kitchen closet and reach the perfect flavor. Other people prefer to bottle when the flavor is just right, then store in the refrigerator. Or you might be in the middle, allowing it a couple of days at room temperature before cooling to maintain flavor. Just be careful that you don’t allow it to get to the point where it becomes too sour in the bottle! Here’s how to make a SCOBY Hotel. Maintain your SCOBY Hotel and you will have viable Kombucha cultures for life! You can’t hurt the SCOBYs! Rip, tear, shred, they feel no pain and will continue to make good Kombucha! You can even use metal such as a knife or scissors to cut them, the very brief exposure to metal is not an issue.